The strength of demand for Costsaver’s pioneering ‘Guided Independent’ style of touring sees the brand expand further for 2019, with the launch of a brand new Asia programme. The Taj Mahal without people, early morning shot. Already taking independent and value-conscious touring customers right across Europe, North Africa, USA, Canada and South America, Costsaver’s inaugural Asia programme will serve seven new countries – Japan, China, Thailand, Vietnam, Cambodia, India and Hong Kong – from just $206 per day. Costsaver’s value tours cover all the essentials, such as hand-picked accommodation, quality transport, city tours and plenty of meals. The rest is then left up to the traveller, so that they can tailor their own personalised dream holiday – either choosing to enjoy a selection of Costsaver’s hand-crafted Optional Experiences or simply uncovering the destination their own way. Japan Discovery (10 days) – Visiting Tokyo, Kyoto and Osaka, this is the perfect trip for clients who wish to visit Japan’s top cities, whilst also ticking off iconic sights such as Mount Fuji and Hiroshima along the way. Priced from $4,925* per person. Vietnam and Cambodia Adventure (14 days) – Combines a beach stay in Nha Trang with visits to Vietnam and Cambodia’s iconic cities; Hanoi, Hoi An, Ho Chi Minh City and Siem Reap in Cambodia. This trip is the perfect option for clients who want some relaxation time amidst city sightseeing, culture and history.Priced from $3,395* per person. Iconic Thailand (nine days) – Ideal for clients who want to see the sights of the rural ‘Golden Triangle’ whilst also ticking off Thailand’s buzzing cities. Beginning in Bangkok and culminating in Chiang Mai, clients will see the rural countryside landscapes of Thailand, as well as its cultural hubs. Priced from $2,095* per person. Wonders of China (10 days) – Visiting the main cities of China including Shanghai, Xi’an and Beijing, with all internal flights included, clients will get a taste for the ancient history of China and the iconic sites which make the country a bucket list destination for many. Priced from $3,075* per person. MINI STAY: Hong Kong Highlights (four days) – Can be booked as a standalone tour, or as an extension to any Costsaver trip; clients will spend three nights exploring this popular stopover destination more deeply. A single-centre experience, clients can leave their luggage and explore with an expert at the helm.Priced from $825* per person. 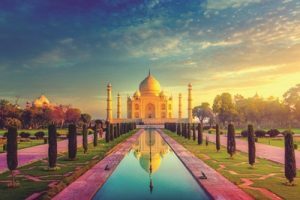 Highlights of India (10 days) – Clients can go tiger spotting in Ranthambore National Park, and explore the majesty of Rajasthan and India’s bustling city of Delhi, culminating in a visit to Agra. Priced from $2,395* per person. Highlights of India with Varanasi (12 days) – This itinerary offers clients the opportunity to experience life on the banks of the River Ganges, with an included visit to Varanasi, alongside tiger spotting in Ranthambore, and visits to Rajasthan, Delhi and Agra. Priced from $3,450*per person. All Costsaver tours include accommodation in handpicked hotels, daily breakfast plus additional dining experiences, essential highlight sightseeing, expert Travel Director, comfortable coach transportation and airport transfers. The rest is Tailored by You.